What do site building and baking have in common? Being a pastry chef or a baker, you know that making these delicious, palm-of-your-hand desserts involves a variety of key ingredients. The exclusion of any of these elements will carry your dainty delectables directly to the trashcan. Any site building connoisseur will tell you that similar to baking, the recipe for a successful website also includes a few essential details that cannot be omitted. Having a well-planned, professional site can add credibility to your business, and be the key to getting your cakes a cult following. With the site building tips we have here, your scrumptious shop will soon be equipped with the recipe for success. A homepage is to a website as flour is to a cupcake – the base that supports the final product, and the most important ingredient. Building an engaging homepage is the key to a maintaining a successful site, and driving repeat traffic. Whether being referred by a friend, or merely stumbling across your business through search engine results, when a visitor is directed to your site they’re first stop is often your homepage. This page helps to shape your viewers’ first impression, and whether – or not – your business is worthy of their time. If the most important page on your site can’t grab their attention, you can guarantee they won’t be perusing through the rest of your website. So, what can you do to intrigue your visitors? To acquire profitable traffic, give your viewer enough information to make them want to click through the rest of your navigation. Include high quality pictures and well-formatted content. Use our Style Designer to ensure your colors match throughout your site. And most importantly, do not allow your homepage to look cluttered – when it comes to having a great website, less is more. The navigation for your website are the eggs for your cupcakes – they’re what binds them together. Having proper navigation may not be the most eye-catching, but sloppy navigation with never go unnoticed. An imperative factor of a top performing navigation is keeping it intuitive. Use easy-to-follow terms such as “Menu,” “Gallery” and “Testimonials” to ensure your customers don’t get lost behind the scenes. Something as small site navigation can be the difference between a profitable and unprofitable website. A gallery on your website is similar to the vanilla extract in most treats – one small factor goes a long way. Let’s say a potential customer is searching “local cupcake shops” on Google and your SEO tactics have bumped you to the top of their search results along with the best shops in your area. Let’s say the customer will be comparing your business website along with the other top sites populate their search results page, clicking through to many of your competitors. What’s going to make you stand out among the rest? The answer to your competitive needs just might be an image gallery. Maintaining an updated gallery on your website allows your customers to visualize your talent and creativity. You can showcase different cupcakes and pastries you’ve intricately decorated for special events, as well as exciting new flavors you’ve concocted in your lab of a kitchen. Your gallery is no place to be bashful – boast about your skills and accomplishments to show customers that you are the baker from whom they should be ordering. 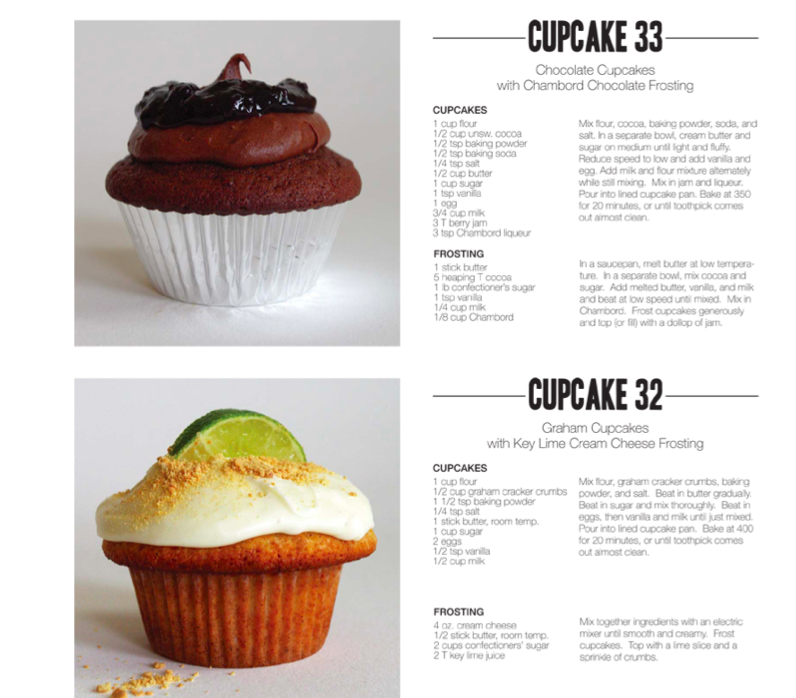 Ming Makes Cupcakes brilliantly displays her recipes with gorgeous photos, leaving your mouth watering. The sugar of your site-building recipe is your contact page. This is where you will butter up your customers, showing them they’d be crazy not to contact you. Try adding incentives – give new customers 1 free pastry with every 11 they purchase. Your enticement leaves customer willing to give your shop a try and will, undoubtedly, fall in love thereafter. In addition, add a contact form on your page with a line allowing customers to place order for your products. This will streamline your process and make buying from you hassle free! *Pro Tip: Add social networking “Share” buttons onto your contact page to expand your reach. We hope these tips have helped you gain perspective on crafting your perfect website to match your cakes. Once you’ve given your business website the look it needs, your boost in business will be the icing on the cake.